Bungalow med 2 sovrum med underbar utsikt över stranden Cala Gran. Beläget i bostadsområdet i Playa d'Or i centrum av Cala d'Or och 5 minuter till fots kan du hitta barer restauranger och stormarknader. To couples stayed for 5 nights. Apartment has two bedrooms and two bathrooms. Comfortable. A/C in all rooms. All utensils needed. It is just steps from the beach and walking distance to supermarket and resturants. Big patio with room to eat and enjoy the sun all day if you want to have a break from the beach. Host is really nice and gives all information needed and has usefull recommendations. 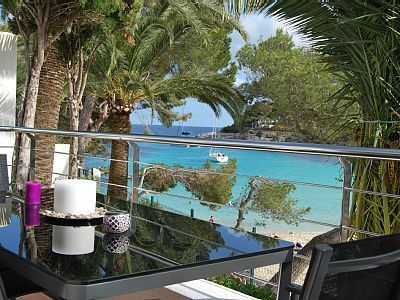 If we return to Cala d`or we will stay here again! Sehr sauberer und moderner Familienbungalow. Wir haben uns sehr wohl gefühlt. Eine technisch hochwertigere Kaffeemaschine hätte unser den ganzen Urlaub abgerundet. We had an amazing time with my baby. Barbara was thee best host. I highly recommend this property. Happy vacation! Vermieterin seht nett, und zuvorkommend. It is a true gem, a splendid combination of excellent location, good service and nice standard. We stayed for a week and there was nothing but good vibrations. It was a pleasure to host you in our apartment.